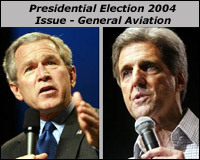 Did you know both presidential candidates are pilots? President George Bush's military experience in the National Guard has been discussed regularly during the campaign so I am sure many people knew of his experiences flying F-102 fighters in the Texas Air National Guard. Senator John Kerry is also a pilot and has been flying for over 30 years. With the election less than 72 hours away I thought I would share with you a recent article written by the Aircraft Owner and Pilots Association (AOPA). AOPA asked each candidate some questions about general aviation. You can view the responses to the questions on AOPA's webiste - AOPA Interviews the Candidates on GA. Of course you should not vote on one issue alone but it is important for pilots to see where each candidate stands on issues that are near and dear to us.